Despite what seems to be a public fascination with identity theft as the latest innovation in cybercrime, it isn’t really new. Even before the Internet came along, criminals could steal and manipulate identity data by modifying the magnetic strip on the back of a credit card to access a different account than the one listed on the front of the card. This would allow the thief to present a credit card and identification that matched and hope that the employee didn’t actually look at the name on the receipt. Thanks to VMware you can barely turn around today without someone using the V-word and with every aspect of the English language, and some from ancient Sumeria, now beginning with V it will only get worse. There is no question that virtualization holds a lot of promise for the enterprise, from decreased cost to increased efficiency, but between the ideal and the reality is a chasm of broken promises, mismatched expectations and shady vendors waiting to gobble up your dollars and leave a trail of misery and despair in their wake. 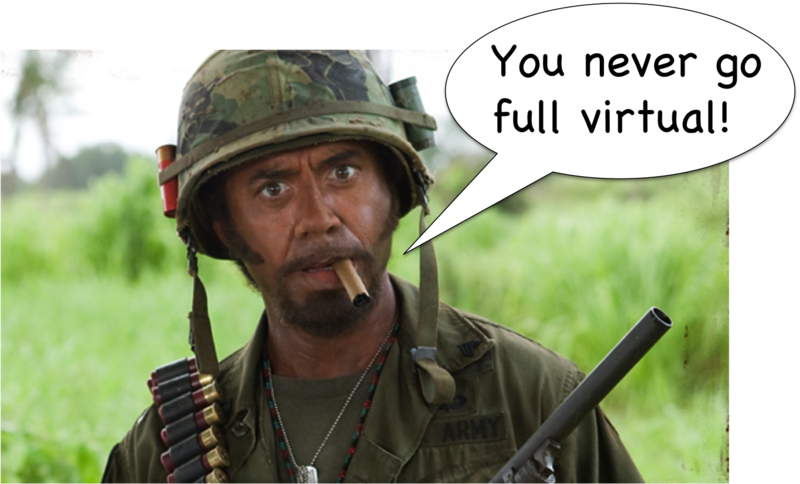 To help avoid the landmines I give you the top myths, misconceptions, half-truths and outright lies about virtualization. It seems counter-intuitive that virtualization would introduce management complexity, but the reality is that all the security and systems management requirements currently facing enterprises today do not disappear simply because an OS is a guest within a virtual environment, in fact they increase. Not only does one need to continue to maintain the integrity of the guest OS (configuration, patch, security, application and user management and provisioning), one also needs to maintain the integrity of the virtual layer as well. Problem is this is done through disparate tools managed by FTE’s (full time employees) with disparate skills sets. Organizations also move from a fairly static environment in the physical world, where it takes time to provision a system and deploy the OS and associated applications, to a very dynamic environment in the virtual world where managing guest systems – VMsprawl – becomes an exercise in whack-a-mole. Below are some management capabilities that VMware shared/demoed at VMworld. Vddk (Virtual disk development kit) allows one to apply updates by mounting an offline virtual machine as a file system, and then performing file operations to the mounted file system. They ignored the fact that file operations are a poor replacement for systems management, such as applying patches. This method won’t work with windows patch executables, nor will it work with rpm patches which must execute to apply. Offline VDI: The virtual machine can be checked out to a mobile computer in anticipation of a user going on the road and being disconnected from the data center. Unfortunately, data transfers, including the diff’s are very large and one needs to be aware of the impact on the network. vCenter – Management framework for viewing and managing a large set of virtual machines across a large set of hardware, a seperate management framework than what IT will use to manage physcial environments. Linked Clones – Among other things, this allows for multiple virtual machine images to serve as a source for a VM instance, however without a link to the parent, clones won’t work. Virtual Machine Proliferation – Since it is so easy to make a snapshot of a machine and to provision a new machine simply by copying another and tweaking a few key parameters (like the computer name), there are tons of machines that get made. Keeping track of the resulting virtual machines – VMsprawl – is a huge problem. Additionally disk utilization is often under estimated as the number of these machines and their snapshots grows very quickly. Want to guess how many start-ups will be knocking on your door to solve one or more of the above management issues? Customers that are drawn to virtualization should be aware virtualization adds another layer that needs to be managed and secured. Data starts moving around in ways it never did before as virtual machines are simply files that can be moved wherever. Static security measures like physical security and network firewalls don’t apply in the same way and need to be augmented with additional security measures, which will increase both cost and complexity. Network operations, security operations, and IT operations will inherit management of both the physical and the virtual systems so their jobs get more complicated in some ways, and they get simpler in other ways. Again it would seem counter intuitive that virtualization doesn’t increase security, but the reality is that virtualization adds a level of complexity to organizational security that is marked by new attack vectors in the virtual layer, as well as the lack of security built into virtual environments, which is made even more difficult by the expertise required to secure virtual environments, skills that are sadly lacking in the industry. The Hoff has written extensively about virtualization security and securing virtual environments (here) – they are different, yet equally complex and hairy – and nowhere will you find a better overall resource to help untangle the Tet offensive of virtualization security or securing virtual environments than from the Hoff. What is really interesting about the current state of virtualization technology in the enterprise is the amount of specialization that is required to effectively manage and secure these environments, not only will one need to understand, at least conceptually, the dynamics of systems and security management, but one will also need to understand the technical implementations of the various controls, the use and adminstration of the management tools, and of course follow what is a very dynamic evolution of technology in a rapidly changing market. Infrastructure consolidation – Adding big iron and removing a bunch of smaller machines may look like an exercise in cost-cutting, but remember you still have to buy the big iron, hire consultants to help with the implementation, acquire new licenses, deploy stuff, and of course no one is going to give you money for the machines you no longer use. FTE reduction – Consolidating infrastructure should allow one to realize a reduction in FTE’s right? The problem is that now you need FTE’s with different skills sets, such as how to actually deploy, manage, secure and manage these virtual environments, which now require separate management infrastructures. Decrease in licensing costs – Yes, well, no, depends on if you want to pirate software or not, which is actually easier in virtual environments. With virtual sprawl software asset and license management just jumped the complexity shark. solutions that generate a quick payback with virtually no risk and position your organization to take advantage of available and emerging real-time infrastructure enablers designed to closely align your business needs with IT resources.